As a family nutritionist I often hear from friends, “What’s in your child’s lunch box?” For my 4 year old, most days I use the bento box system from www.laptoplunches.com. Somehow having the little containers lined up inside this box makes packing easier. The system contains one large box with reusable containers that fit inside. It can then be carried in a thermal square shaped container of your choice. There’s NO phthalates, bisphenol A (BPA), or lead in the packaging. I suggest ordering a couple extra containers WITH lids. I often include dips, dressings, or yogurt and come up short on lids. You may also want to purchase re-usable sandwich baggies. I’m searching for good brands on the market that are safe and will last –please comment if you have any suggestions. Re-usable sandwich bags are great for foods like pepper slices, whole grain pretzels or whole wheat pita breads. 3 Slices of Applegate Farms No nitrates Added- Uncured Turkey Salami. The ingredients are Turkey (with out antibiotics, growth promotants or animal by products) water, sodium lactate (from corn or beets), salt, garlic, beet powder, paprika and spices. The Turkey Salami by Applegate is a couple dollars less than the turkey. Because it’s nitrate free it goes bad fast! After opening it, I separate the package into 3 slice servings and wrap them individually in wax paper. Then, I put them back in its original plastic packaging and freeze. The day before while preparing lunch or dinner, I take out a serving and place it in the fridge. My daughter loves it! Organic red and yellow pepper slices and 3 little organic baby carrots. Set aside a few more for the next day’s snack. Kidney beans with her favorite low fat salad dressing. When my daughter was a baby, she wouldn’t eat beans, but that didn’t stop me from offering them to her. For months I put a few on her plate before she would try them. Now she requests them almost 7 days a week. Lentils or black beans with corn are other favorites. Remember, it can take several times for a child to like or even try a new food! Don’t get discouraged—keep offering the healthy item! Be sure to eat it too. Organic vanilla yogurt and a dash of cinnamon in the Bento box-itty bitty container. She calls this dessert. Tiny organic Fuji apple–so small it fits with the box closed. Develop a system that works for you to stream line packing lunch for your child or children. Try packing lunch while prepping or cleaning up lunch or dinner the day before to make mornings less hectic. Once you get a few successful healthy lunches your child eats and an easy system in place you’ll find packing up a quick lunch a breeze. 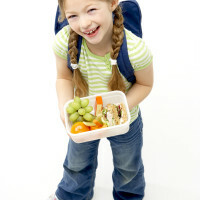 Check back for more tips on packing lunch for your child. And visit meal time tips. « Chicken Nuggets: Are They Really That Bad? This is a great idea so the child will find it fun opening the small boxes too. If only my daughter would eat all the stuff you mentioned above!